Amsterdam Metalfest will take place in Amsterdam, Netherlands on October 15, 2016. Aborted, Textures and Humanity’s Last Breath are among the bands that will perform at Amsterdam Metalfest. Netherlands Deathfest II will take place at 013 in Tilburg, Netherlands on March 3-5, 2017. 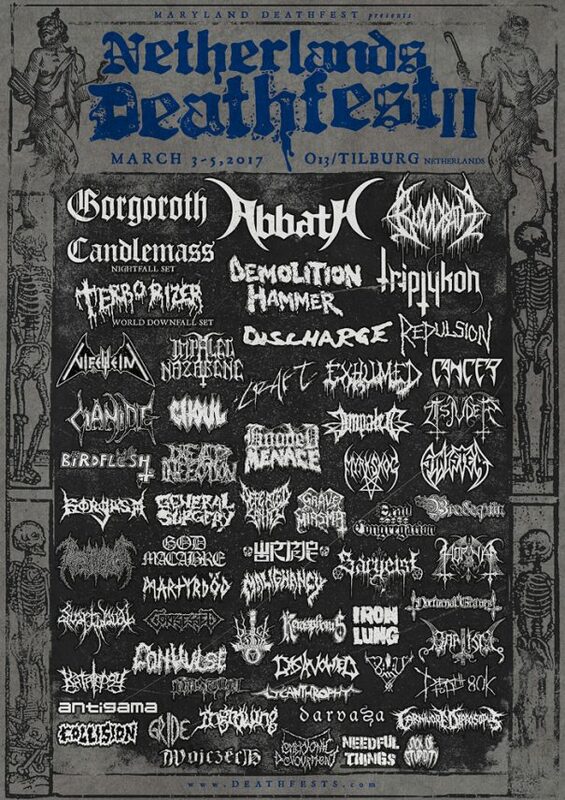 Bloodbath, Demolition Hammer and Gorgoroth are among the bands that will perform at Netherlands Deathfest II festival. Into The Grave will take place in Leeuwarden, The Netherlands on August 12-13, 2016. Slayer, Carcass and Kreator are among the bands that will perform at Into The Grave 2016 festival. ProgPower Europe 2016 will take place in Jc Sjiwa, Baarlo, The Netherlands on September 30 – October 2, 2016. Threshold, Textures and Chaos Divine are among the bands that will perform at ProgPower Europe 2016 Festival. Bloodshed Fest 2016 will take place at Dynamo in Eindhoven, The Netherlands on October 14-16, 2016. Atari Teenage Riot, Bolt and Primordial are among the bands that will perform at Bloodshed Fest 2016 festival. Fortarock 2016 will take place at Goffertpark in Nijmegen, The Netherlands on June 04-05, 2016. Megadeth, King Diamond and Abbath are among the bands that will perform at Fortarock 2016 festival. Stonehenge Festival 2016 will take place at Stationsplein 1, 8331 GM, Steenwijk, The Netherlands on July 30, 2016. Dying Fetus, Immolation and Misery Index are among the bands that will perform at the Stonehenge Festival 2016 festival. Stonehenge Indoor Festival 2016 will take place at Poppodium Iduna in Drachten Nederlands on April 17, 2016. Gorguts, Morgoth and Incantation are among the bands that will perform at the Stonehenge Indoor Festival 2016 festival. Metalyard 2016 will take place at Poppodium Atak in Enschede, Netherlands on March 26, 2016. Sear Bliss, Slechtvalk and 7th Symphony are among the bands that will perform at the Metalyard 2016 festival. Speedfest 2015 will take place in Eindhoven, The Netherlands on November 21, 2015. Carcass, Obituary and Napalm Death are among the bands that will perform at the Speedfest 2015 festival. Netherlands Deathfest 2016 will take place at 013 in Tilburg, The Netherlands on February 26-28, 2016. Autopsy, Asphyx and Entrails are among the bands that will perform at the Netherlands Deathfest 2016 festival. Eindhoven Metal Meeting 2015 will take place in Eindhoven, The Netherlands on December 11-12, 2015. Behemoth, Candlemass and Samael are among the bands that will perform at the Eindhoven Metal Meeting 2015 festival.